A mixture of small independent family run hotels and B&B's offering quality accommodation and food. The Dordogne region of France is dominated by the magnificent Dordogne river and its stunning valley lined with historic delights. Our self guided cycling holiday passes through one picturesque village after another. La Roque Gageac has been built into steep sandstone cliffs which rise high above the river with fascinating architecture and a troglodyte fort built into the cliff face. The beautiful town of Sarlat is famous for its medieval buildings and its lively street market. Sarlat has remained preserved from modern development and is considered to be one of the towns most representative of 14th century France. Your cycling tour starts and finishes at Gourdon, which is a beautiful village built in tiers around a hill, before progressing to Rocamadour, another wonderful village clinging to the cliffs overlooking the Ouysse gorge. In addition, the Dordogne has an impressive concentration of chateaux lining the valley such as Fenelon, Beynac, Castlenaud and Marqueyssac. There are also important pre-historic sites with cave drawings to discover on your French cycling holiday, which follows quiet roads through pretty countryside steeped in history. 6 days self-guided cycling moving between hotels & B&B’s. Staying in 2 guest houses for two nights. The holiday is graded moderate. Two of the days allow you to choose the amount of cycling you wish to do. Average days on your cycling holiday include about 40—50km cycling with the maximum in any one day being 62km. Ascents and descents are relatively limited throughout the week. The cycling takes place on good roads which are generally quiet. They become busier during certain holiday periods. Arrive in Gourdon, a lovely medieval town dominated by its grand sandstone coloured church. If time allows, cycle out to the Grottes de Cougnac and view its artwork and rock formations. Day 8: Departure - Holiday ends after breakfast. A mixture of B&B’s and small independent family run hotels offering a high quality of service (2 or 3 star). Many are in historic properties, set in wonderful medieval village locations, some have swimming pools. Warm welcome and gastronomic food. All breakfasts and four evening meals included in holiday price. Eurostar, the TGV & local TER trains run services from London St Pancras to Gourdon. Take the Eurostar to Paris where you need to change station. Take the train from Paris direction Toulouse or Cerbere and descend at Gourdon. Some trains (Teoz) are direct to Souillac, whilst others need a further change, some via Brive la Gaillarde. Ryan Air & Flybe have scheduled flights from several UK airports to Bergerac. Taxi or hire car for the short transfer. 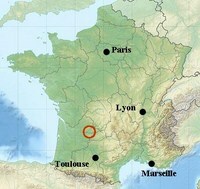 A greater choice of operators fly to Toulouse from where there is a shuttle bus to Toulouse train station. Please visit our travel shop for useful links to transport operators. Please make sure you check that the holiday is available for your preferred date before making any travel arrangements.